The “Pinkalicious” cast performs with various instruments. The kid-friendly musical will run at the Marriott Theatre through August 19. Feeling blue? “Pinkalicious” is sure to cheer any audience member up. The short musical based on a popular children’s book opened this July 14 at the Marriott Theatre featuring Northwestern alumni and current students in its cast. 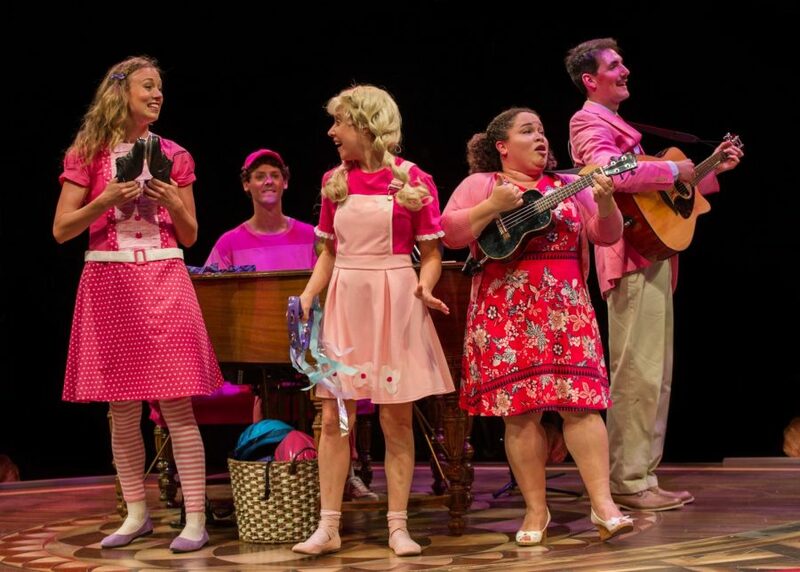 The kid-friendly musical follows a young girl named Pinkalicious Pinkerton with a sweet tooth and a love for the color pink, which often lands her in trouble. The musical is usually performed with a pre-recorded soundtrack, said director and choreographer Amanda Tanguay. However, the Marriott production adds to the soundtrack with their own instruments. Tanguay said she decided to include live music on top of the soundtrack because of a piano placed onstage for the musical “Murder for Two,” which is running in the theater at the same time. Wade Elkins (Bienen ‘18) plays Pinkalicious’ brother, Peter in the show. He said the additional music makes the show “even more fun” for adults and enhances the story and characters. “(It) really gives a picture of who this family is and makes it more fun in the process,” said Elkins, who attended Bienen’s graduate program. The play’s cast also features three other NU alumni and students as understudies. Recent graduate Sarah Ohlson (Communication ‘18) is one of them. Ohslon understudies the roles of Pinkalicious’ friend Allison and another character called Dr. Wink. She said the production has been “an absolute blast” to be a part of. The other two Northwestern understudies are Alexander Rothfield (Communication ‘19) and Grace Bobber (Communication ‘19). Though the show is based off a children’s book and is largely geared towards a young audience, Elkins added that entire families are able to enjoy the play and resonate with the lessons the Pinkerton family learn together. Pinkalicious will run at the Marriott Theatre until August 19.